New Center Services Director – Welcome Back, Claire! 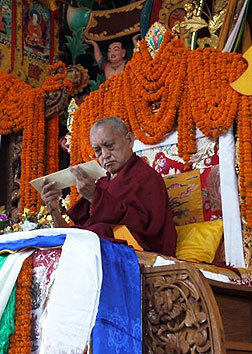 Lama Zopa Rinpoche attends the third of a three-day long life puja offered by Khadro-la at Kopan, May 2010. September 12 – 25 Light of the Path – registration now open! Transforming bad conditions into happiness by looking at them as positive, favorable conditions is the way to make problems, bad conditions, beneficial, by using them as the path to enlightenment. How? Meditating on loving kindness and bodhichitta destroys the ego. We use them as a weapon to destroy the self-cherishing thought, which brings all obstacles. So, meditate on bodhichitta and wisdom. In your case, use all the criticism and bad reputation, whether it is a result of your mistake or not, to destroy your ego and self-cherishing thought, which blocks one from achieving enlightenment. As long as self-cherishing abides in one’s heart, it stops one achieving enlightenment and benefiting all sentient beings. You can think of the kindness of the other person that helps you to destroy your ego. Usually, you are always supporting your ego, even developing it. Now, this person (the enemy) is helping to destroy your self-cherishing thought, so what is regarded as your enemy is really your most kind friend! What we do is use undesirable situations, loss, etc., as experiences to be of most benefit to all sentient beings. This is not just making one’s own life emotionally happy, for some temporary peace. There are other thought transformation teachings – so many ways you can make your life experience most beneficial for yourself and others. The essence is – if you are happy, make it beneficial for sentient beings; if you are suffering, use it as the cause to bring happiness to others. This way, whatever kind of life experience you have, use it on the path. There is no interruption to Dharma practice, and one’s life is most beneficial. Go Tsampa said, “Others’ mistakes are one’s own mistakes. Clarify the appearance of the mistake into the deity.” This means, however one is treated is the result of one’s own negative karma. Even if others create a bad reputation for you, and there is no apparent cause from your side to experience the result, still, you have to have created the cause. You can see what this yogi is saying. The second part of this technique is looking at that person as the guru, even visualizing that person in the form of a deity. This stops anger and negative emotional thoughts arising and the suffering results of those. Excerpted from “Criticism” in Lama Zopa Rinpoche’s Online Advice Book freely distributed by Lama Yeshe Wisdom Archive. We are delighted to inform you that Claire Isitt has been appointed Center Services Director (again!) with effect from June 7, 2010. Many of you would be familiar with Claire who had held this position for nine years before a brief attempt to retire from service. (Her extensive experience in the FPMT can be gleaned from her note below). of modern communications, we are confident that there will be no adverse impact on how we interface with one another. We can also assure you that there will be no loss of continuity for any outstanding questions and issues as one of the many wonderful advantages of having Claire back is that she knows the FPMT community like the back of her hand! “I began offering service in the FPMT back in 1989 as a volunteer at Jamyang Buddhist Centre, London, UK. A Kopan November course followed, which led to the three-month Vajrasattva retreat at Tushita Meditation Centre in Dharamsala and some volunteer help there afterwards. Then a second Kopan November course, which led to offering service as the spiritual program coordinator at Tushita, Dharamsala. This was a very special opportunity, which lasted for about three years. I then was extremely fortunate to be asked to take on the role of director of the first Lotsawa Rinchen Zangpo Translator Program (LRZTP) in Dharamsala, which also enabled me to learn some Tibetan. After three years as LRZTP director, I handed over to Merry Colony, and returned to the UK. I continued to offer service, this time as manager of Jamyang Buddhist Centre under Alison Murdoch’s directorship. Two years later, I was asked to join the International Office team as center services director, a challenge and honour which I was terrified and thrilled to accept. I worked as center services director for nine years, resigning in December 2008. 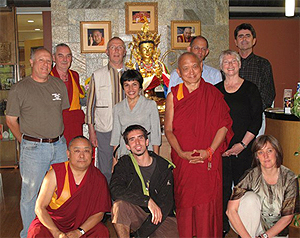 I was then happily able to coordinate and facilitate the wonderful CPMT meeting hosted by Institut Vajra Yogini in May 2009. That was followed by a break from FPMT service, during which I experienced working in local government in England. 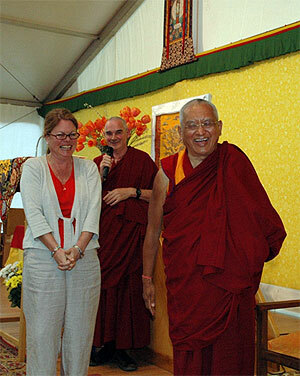 To contact Claire, please write to claire@fpmt.org. “My heartfelt thanks for the opportunity of working with you – it’s so amazing what the FPMT family accomplishes every second of the day under the loving guidance of Rinpoche! The Sera Je Food Fund is one of FPMT’s most important projects and in May 2010, FPMT was able to send US$125,963.16 to Sera Je Monastery. This contribution covers six months’ worth of meals (we are now offering three meals per day) for all 2,600 monks currently studying at Sera Je. The extensive dedications made by the monks of Sera Je Monastery for the Fund’s sponsors mean that, for as long as the monastery exists, you will receive the merit of making offerings to the monks. The Sera Je Abbott has arranged for prayers to be done by all the monks of Sera Je during the month of Saka Dawa (when merit is multiplied up to 100 million times), and those prayers are dedicated to all the kind sponsors and supporters of the Sera Je Food Fund. We were happy to receive this letter of thanks from the abbot of Sera Je, Khen Rinpoche Acharya Geshe Lobsang Palden. This is the nineteenth year that FPMT has been offering food to the monks at Sera Je Monastery. To date the Sera Je Food Fund has provided over 10,000,000 meals. That’s 2,500,000 meals per year, 7,800 meals every day. Please rejoice in this incredible effort! Congratulations to all our 2009 Merit Box grant recipients! Awards were announced on May 27 and we were thrilled to be able to grant funds to 15 different projects out of 18 proposals. This would not have been possible without the generosity of our Merit Box coordinators and practitioners all over the world. Do you have a Merit Box? Please consider getting one and then staying tuned in for the International Merit Box 2010 launch in July. Specific information about the 2009 disbursements will soon be freely available. Basic Program: COMING VERY SOON! The long-awaited BP Homestudy package, Engaging in the Bodhisattva Deeds Part Two, Chapter VI-X, will be released soon. This is a comprehensive package with guided meditations for practice and retreat. It includes extensive and accessible teachings on both the “Patience” and the “Wisdom” chapters, with a well-edited transcript, generously contributed by ABC (Amitabha Buddhist Center), Singapore! On May 2, 27 students from ABC sat for the BP final exam – all but one passed! 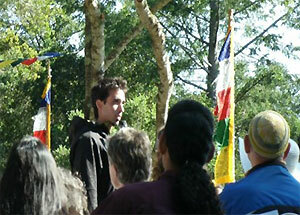 A very grateful thanks to Geshe Chonyi for teaching all nine subjects of the core curriculum. Thanks also go to interpreter and teaching assistant Ven. Gyurme. Over a six-year period, the BP was offered to classes of up to a hundred students, with many succeeding to complete the entire program, and many looking forward to deepening their understanding during the next round of BP, starting mid-2011 at ABC! Living in the Path: Four video clips from LP Module 1, “Motivation for Life” have been edited, making a big difference to the listening experience, particularly when listening with headphones. Check out the edited video clips: By Now I Would be a Fish (2:45); The Very Beginning of Dharma (9:23); Life is Like a Bubble (17:18); and Tonglen (13:28). Thanks to Ven. Dechen for her patience with this tedious editing work (20 minutes of editing are needed per minute of video)! NEW! Discovering Buddhism DVDs are now available with subtitles in English, Français, Deutsch, and Español. Also, newly added to this series is the 10-minute FPMT Documentary. We encourage all centers to have this fabulous resource in your libraries and shops. To support this, we are now offering free shipping to any center who orders 30 copies or more! Please write to diana@fpmt.org with your order. NEW! Initial Practices of Vajrayogini is now in stock! This new edition incorporates all the revisions and comments of a diligent team of Vajrayogini practitioners who have overseen this laborious work. Thanks especially to Sze Gee Toh, Ven. Sangye Khadro, Elaine Jackson, Valerie Thomas and Ani Fran. Heart Advice for Death and Dying is now published in French as Conseils du coeur pour la mort et la fin de vie, thanks to Les Editions Vajra Yogini! A five-day Foundation Training will be hosted October 30 – November 4 in Cozumel, Mexico. If the training alone isn’t enough to entice you, we hope that spending time on Mexico’s beautiful coast will! Stay tuned for more information. International Office recently put up the Display Pack – printed in double size and mounted on the wall leading to our workspace – and it looks FABULOUS! Rinpoche was particularly pleased to see the “Compassion Quote” – his advice on the need to integrate that attitude in our daily life – given such prominence. The Display Pack is for all centers, study groups, projects and services to use. goal of $100K for 2010. Our heartfelt thanks to all of our “workers” around the world who have sacrificed in these challenging times, and our gratitude for your kindness and service in all its forms, you truly make a difference. Watch the continued progress of this campaign by joining the Work a Day for Rinpoche Facebook page. Osel Hita wowed everyone by turning up at Vajrapani Institute on Big Love Day for the consecration of Lama Yeshe’s new stupa and commemoration of Lama’s life. 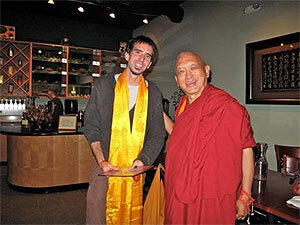 It was a special occasion which drew many of the FPMT’s early students. re-acquainted himself with the organization. 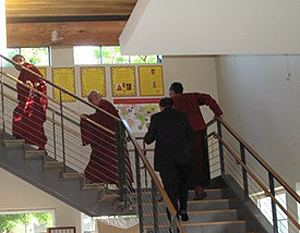 Rinpoche and the other Board members were thrilled that he turned up, and invited him back with great enthusiasm. On his part, Osel said he would – if the timing fits. Carina Rumrill’s full interview with Osel is in the July – September 2010 print issue of Mandala, which goes out on June 9. A report on Big Love Day will appear online as part of Mandala’s online exclusives. To raise its public profile and reach out to the wider community, Land of Medicine Buddha (LMB) helped to sponsor the broadcast of The Buddha by the acclaimed director, David Grubin, on KQED Public Television in April 2010. In the agreement, KQED created a TV spot for LMB which was played as part of the opening and closing credits of the broadcast on KQED TV9 and KQED Life, both of which reach a significant audience in North California, that includes schoolchildren and philanthropists. LMB also got exposure on KQED Radio publicity for the film. Denice Macy, LMB’s Director commented that the TV exposure enabled a much wider audience to have a glimpse of LMB’s activities and its gompa and holy objects in technicolor. The association with a prestigious body like a Public Broadcasting network would help to enhance LMB’s community standing as well. The immediate impact of the TV broadcast was captured by the heavy web traffic. Denice reported that as the telecast drew near, the number of visitors to LMB’s site grew and on the actual and subsequent days, the increase was up to 80% above the average. It is not often that FPMT centers engage the public media as a paying client – and LMB’s unusual investment benefitted by bringing the life story and message of the Buddha to a wider audience. Land of Medicine Buddha is seeking a Facility Manager to take care of recruiting and supervising staff for the daily operations of the retreat facility, which include kitchen duties, housekeeping, and grounds/maintenance. The full-time position offers room and meals, a monthly stipend and other benefits. For more information and to apply, email director@medicinebuddha.org Please visit our website at www.landofmedicinebuddha.org. Vajrapani Institute is hiring a new Assistant Director. This is an amazing opportunity for an experienced manager to offer service to a Dharma center! The Assistant Director oversees the center’s operations, including a staff of eight employees. For more information or to apply, please contact current Assistant Director, Anil Moni, at anil@vajrapani.org. FPMT Mongolia has a unique opportunity for a suitable person to offer service as the Chief Operating Officer.